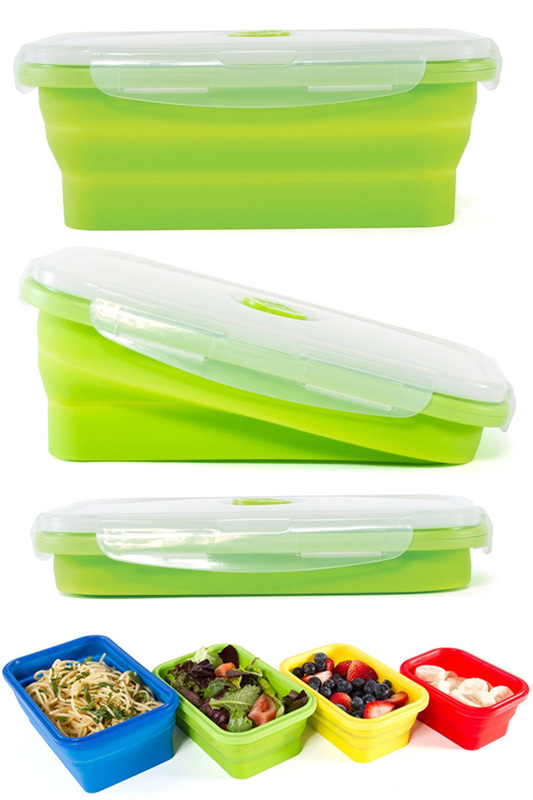 Save space when you're not saving leftovers by using this compact food storage set. 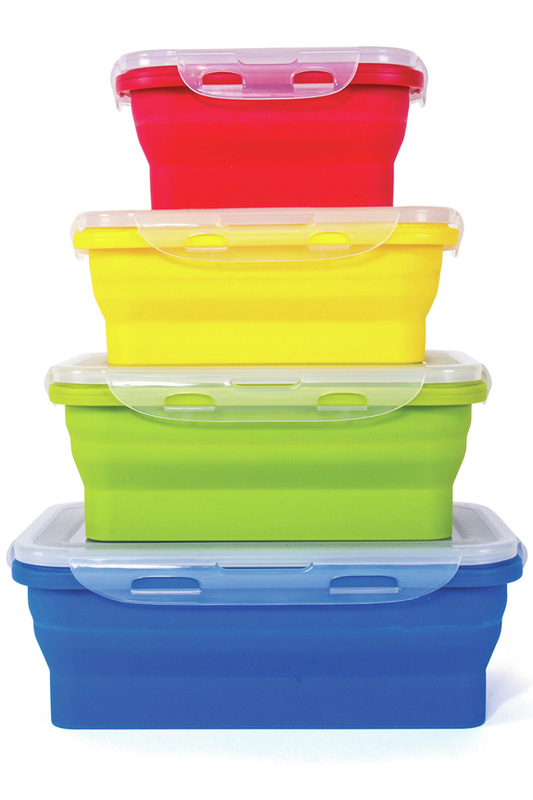 Four colorful silicone bowls provide a range of container sizes, and when you don't have stuff inside, they can press flat to take up almost no room. The locking lids have latches on all four sides to keep food secure, and the internal seal helps to create an airtight chamber to preserve freshness. At the center of each lid, a steam vent allows hot air to escape when cooking in the microwave, but it seals tight under normal conditions. Ideal for meals on the go, or organized storage at home, this set is great for camping, travel, work, school, pantry or fridge. It offers protected storage that keeps food fresh, but it also takes up little space when storage is no longer necessary. Made from thick, high quality materials, this rugged set is built to last, and designed for everyday use. 4 bins with locking lids included. Set Contains: 1 Small (10.5oz), 1 Medium (18oz), 1 Large (26oz), and 1 Extra Large (43oz). Variety Pack. From small to extra large, you'll have the perfect size container for anything you need to transport or store. Space Saving. Just press down to collapse to 1/3 the size! 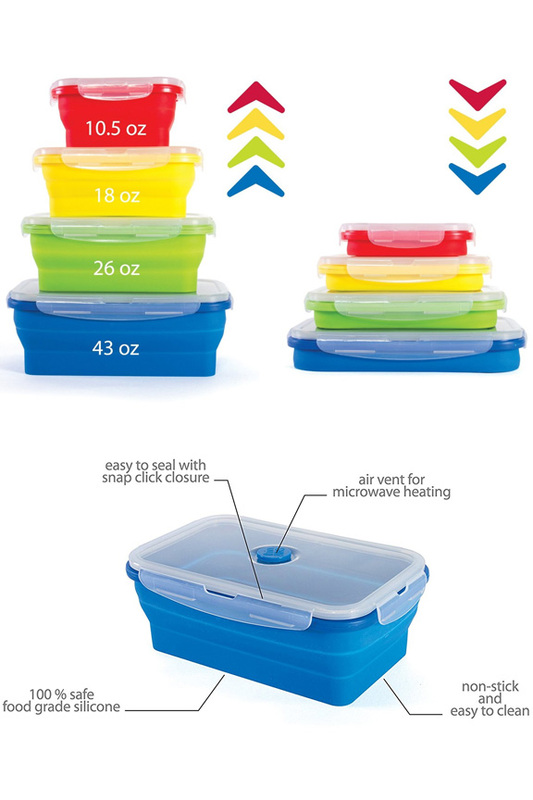 When not in use, these containers take up 60% less space when compared to other options. Airtight and Leak-Proof. Thanks to internal seals and superior deign, these containers are safe and effective when storing liquids, perishables and anything else. Colorful. The vibrant colors make them look great, and they won't fade over time, but they can also be useful for organization purposes. Vented. Cook food in your microwave with the lid on to prevent messes, and the integrated vent will release the perfect amount of steam. Food will remain more moist, and cook more evenly. Locking Lids. The easy-to-use latches are located on all sides for maximum security, and a powerful seal. Just flip up or down to secure or release, and the lid will snap closed to keep the contents safe and fresh, or completely lift off for easy access to what's inside. Stackable. Save even more space by placing one on top of the other. Whether collapsed or fully open, you can easily place stuff on top, or stack them on each other thanks to the thick and sturdy material. Top Quality Silicone. FDA compliant and certified BPA free, the bowls are totally non-toxic and safe, but they also resist staining, and they don't retain odors. Portable. Durable construction makes these perfect for on-the-go food storage, and because they collapse when empty, you can easily slip them in a purse, backpack or briefcase when storage space is no longer needed. Take them with you to work, when camping or hiking, during air travel and more. Versatile. Great for food prep, storage, and as a packed lunch box, you can use them expanded or fully collapsed to store food and save space in the fridge, freezer or a backpack. Microwave, Freezer and Dishwasher safe. Prefer round containers to the rectangle ones featured here? No problem. We also carry a round version of these collapsible silicone food storage containers. To get similar capacity and space-saving technology with a circular shape, check out our Round Silicone Storage Set. It works great as a companion to this one, or as an alternative for anyone looking for a more curvy exterior. Container Capacity Small 10.5oz (red), Medium 18oz (yellow), Large 26oz (green), and Extra Large 43oz (blue). Container Dimensions Red - 5.25" x 3.75" x 2.3", Yellow - 6.25" x 4.25" x 2.3", Green - 7.25" x 4.75" x 2.5", Blue - 8.25" x 5.25" x 2.75"
Material Silicone bowls with plastic rims and lids. Color Multiple: green, blue, yellow, and red. Compatibility Use in the refrigerator, microwave or freezer. Uses Store food at home, or take it with you on the go. 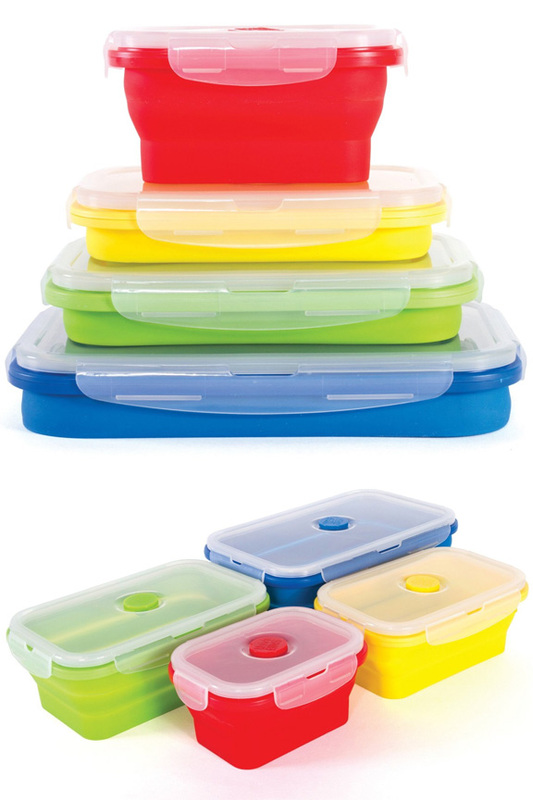 # Containers 4 containers with four lids included. The perfect, space-saving storage option for home, work and travel. Keep food fresh and protected when necessary, but then store out of the way when not in use. Order Yours Today!